When we look at customer experience leaders today, it’s unsurprising there are a number of things they have in common. When looked at from a macro level, we see that many of the individual strategies and tactics that these leaders deploy roll up to three high-level areas of strategic focus. 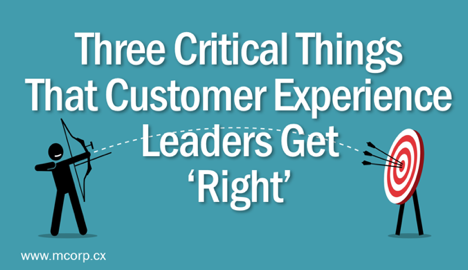 Each of these leaders is exceptionally good at focusing on three critical things: customer centricity, operational excellence and digital transformation, and the places where they intersect. We see these brought to life in companies of all sizes ranging from hyper-growth startups to some of the most successful technology and financial services companies you can think of. The good news is no matter what business you’re in, you can learn from and apply these to your business as well. First and foremost is a commitment to customer centricity – essentially, putting the customer at the center of decision making and your business. This means making a deep understanding of your customers part of your organizational DNA. Knowing who your customers are, and who they aren’t is essential to fostering a successful customer experience from start to finish. It means making sure you deeply understand what your customers want and need, and that you organize your business to design and deliver the products, services and experiences that exceed your customers’ expectations, prioritizing customer goals over operational objectives. As we all know, digital transformation is a fundamental shift in the way business is done. The use of technology to radically improve business performance and keep up with ever-smarter customer and our relationships with them is changing everything. Whether it is across the end to end customer experience, digitally enabling products and services, integrating data and cross-organization analytics and metrics systems. It also means recognizing that today’s customer is very much digital first - but not digital only. Which means it’s critical to recognize that your customers really, really like digital solutions...until the moment they don’t. and operational processes across revenue, cost, and risk. Together, this focus allows an organization to build and maintain connections across all processes with the right measurement and metric systems in place, optimizing the effectiveness of their people, process, information and technology - and demonstrating the results in clear business and financial terms. Some companies, of course, do all these things very well. Consider Amazon, for example. Their primary focus, from Day 1, has been to focus on customer centricity. But they’re also very good in the areas... with decision making driven by putting customers at the center of their business. The results for all CX leaders speak for themselves – outsized top- and bottom-line growth, beating their competition and dominating their markets because they do all three of these things well, at the same time, delivering world-class customer experiences underpinned by world-class business operating models.